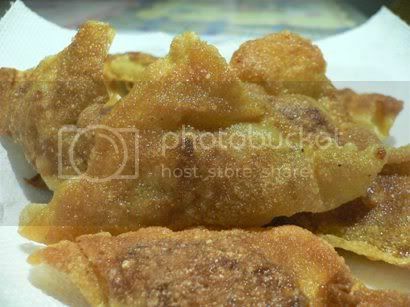 Actually I don't fancy boiled wantons, only those deep fried ones tempts me. Whenever I order wanton mee, I will tell the aunty to give me more char siew, no wantons. Haha! And the aunty will always look at me thinking that I'm some weirdo. But it's for the better so she can save it to those who loves them. Eversince I came here, I start to miss them. Don't ask me why, the craving did came once b4 and today. So I went hunting for the skin and made my own filling. Yummy! The taste is delicious, better than the "Parklane Wanton Mee", the filling they give is always so little. Mmmm, wondering whether they are still around? 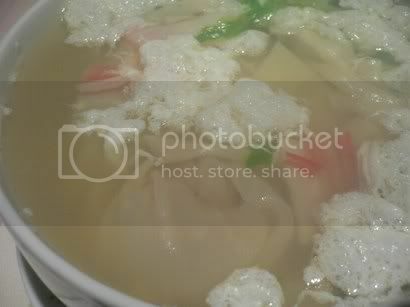 Next up is my Wantons in Bubble Egg White Soup. Was tired of the egg flower pattern so did this instead. 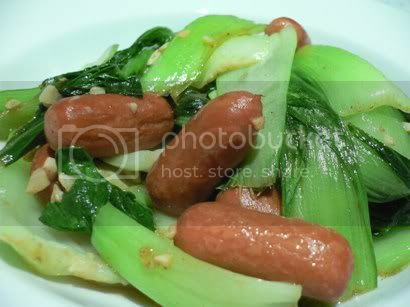 Followed by a Stir Fry Bok Choy with Cocktail Sausages.